Smallest of the eastern nuthatches, brown-headed nuthatches measure four inches or a little longer. Inhabits mixed and coniferous forests from New Jersey and the southeast corner of Pennsylvania, south to Florida and west to eastern Texas and Oklahoma. 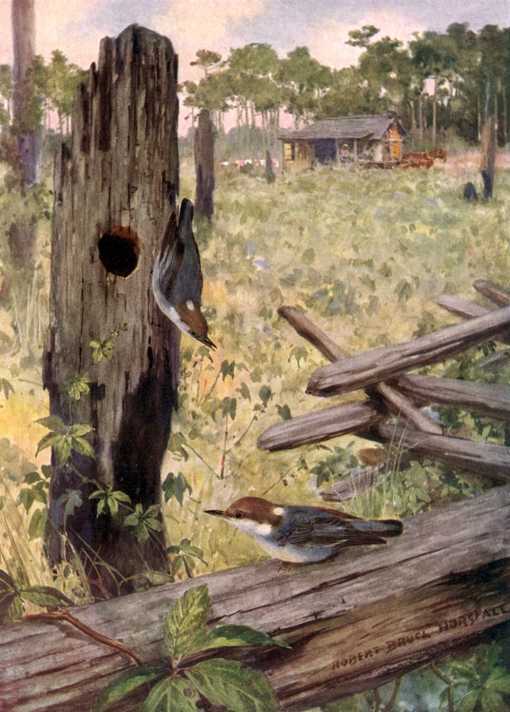 Brown-headed Nuthatches feed (in groups after the rearing season) on insects, spiders, their larva and eggs in tree bark and on pinecone seeds. Assemble with screws in predrilled countersunk pilot holes. Mount this nest box in a wooded area, on a pine tree trunk or large limb from a few feet for easy inspection and maintenance if the box is well concealed, up to out of reach if necessary. Place a few chips on the nest box floor. Females lay four to six, more or less, tiny speckled eggs that hatch after about two weeks of incubation and young leave the nest in about another three weeks. The Brown-headed Nuthatch Birdhouse (same as for Pygmy Nuthatch, Chestnut-backed and Siberian Chickadees) has a 4″ by 4″ floor, 9″ inside ceiling, 1 1/8″ diameter entrance hole located 7″ above the floor, ventilation openings and hinged roof. They build nests of grass, feathers, pine seed “wings” and other soft foliage, usually in pine trees from a hole in a stump to extreme heights, in natural or abandoned cavities, or in cavities they excavate themselves. Chickadees, titmice, and other nuthatches may use this box. Remove the nest from the box well after the brood rearing season is past. Assemble the birdhouse parts with corrosion resistant screws in predrilled countersunk pilot holes. Mount this nest box in a wooded area, on a pine tree trunk or large limb from a few feet for easy inspection and maintenance if the box is well concealed, up to out of reach if necessary. Place a few chips on the nest box floor.